The flat coastal plains of Darlington County stretched out ahead of me; cotton fields and trailers strewn across the landscape. Was this what Bruce Springsteen had in mind when he wrote the song “Darlington County”? This is an area northwest of Myrtle Beach, just over the North Carolina line from Laurenburg and Rockingham. Rural South Carolina revealed two main themes in my thirty six hours visiting. One, much of the Southern charm of NORTH Carolina has been paved over by the NCDOT. South Carolina still has an intimacy that lingers because there are not four lane divided highways plowed through every town. Places that outsiders like myself would write off as deadbeat small towns really do have a life, sometimes quite an interesting one. Secondly, prosperity in the twenty-first century seems to be quite random, except that it is frequently tied to higher education. This trip began when I parked the car in Darlington and cycled off. It is a pleasant enough small town with a nice historic district. But the downtown buildings are pretty empty, and it unfortunately looked like a place that young people would not want to move to, or stay in. Hartsville, twenty miles away, looked prosperous. I had not expected this, because I had never heard of Hartsville, nor of Coker College. Nor did I know of Sonoco Products, which makes packaging, and has nineteen thousand employees worldwide, and is headquartered in Hartsville. Downtown Hartsville had business happening, most seemingly related to the college. Wikipedia tells me that Coker College is mostly funded by endowments from the owners of Sonoco Products. Lunch places downtown were locally owned and prosperous. A non-Starbucks coffee house! Older neighborhoods were well kept. Hartsville seems a happening place. Thirty miles further northeast was Cheraw, my destination for the evening. I rode through miles of rural landscape. I stopped in a small store for a cold drink. Men in hunting outfits and ragged jeans hung around the cash register. In Cheraw, I booked a nice $ 49.00 room at the Days Inn. At dinnertime, I rode the half mile to downtown by bike in the dark. Cheraw is the birthplace of Dizzy Gillespie; they have a statue of him downtown. And Cheraw is an old place, with several building dating before 1800. It is a distinguished looking town. There were several restaurants open downtown on this Saturday night. The nicest looking one was Oskar’s; advertising German food. It’s bar was a nice place for a solo visitor to eat and drink with the locals. And the entrance lobby had a jazz duo playing; aging upright acoustic piano and trumpet. No amplification. Both musicians sounded quite professional; the trumpeter a skinny older black man with white hair; the piano player a rounder middle aged white guy. If we had seen the trumpeter in New Orleans we would have been convinced this guy was Louis Armstrong’s cousin. Maybe he had some connection to Dizzy Gillespie. Eating at a table in the bar area were about five people speaking German, or all things. Who were these people; executives from the BMW plant in Greenville, maybe? The Germans seemed to be having a good time. After a time, the band switched from playing quite professional versions of jazz standards, to quite lame versions of fifties and sixties rock music. The Germans, who had been ignoring the band, suddenly got interested and applauded the music loudly and obnoxiously. When the band played a weak version of Johnny B. Good, one of the Germans started filming the music with his I-Phone. Sunday morning was crisp and cold. I took off into the morning light towards Bennettsville. I passing abandoned factories and houses falling down in the brush. Along a lonely highway, I found this dead bobcat on the side of the road. I had never seen a bobcat before, even though Wikipedia says they live around all parts of the country, and are not an endangered species. On a lonely highway ten miles outside of Bennettsville, I found this great place for lunch. 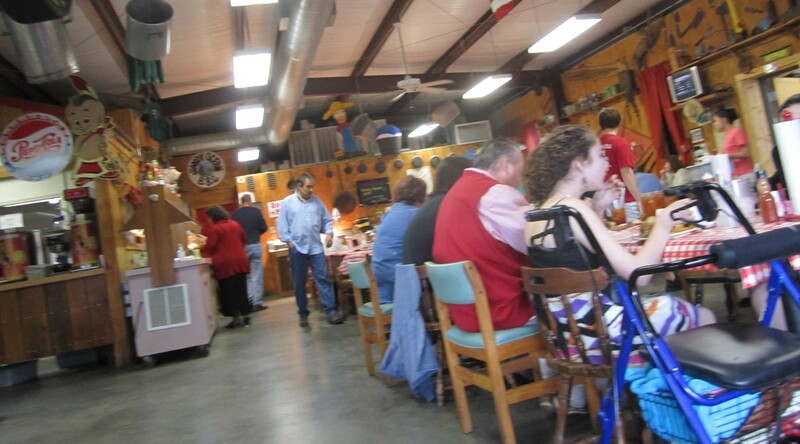 All you can eat, $10.00; great Southern food. Everybody was in there for the after-church repast. The dead bobcat is breaking my heart. I love all of your photos but kept going back to the bobcat. We all had questions about how he died.